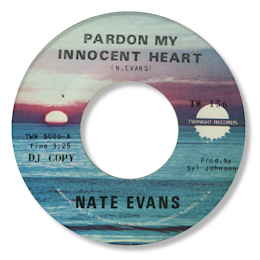 Nate Evans was a native of Gary, IN and spent the 60s there as an opening act for many of the touring acts that came to town. In 1972 he went to Chicago and recorded his own Pardon My Innocent Heart for Syl Johnson who was then working as both an artist and A & R man for Twinight records. This outstanding deep soul piece is rightly celebrated by the cognoscenti for the super chord structure, terrific arrangement and Evans’ powerhouse vocal. Make no mistake this guy could sing. The flip was a heavy hitting Chi Town midpaced “Main Squeeze” which came from the pen of Memphis writer Earl Randle. Johnson himself liked the tracks so much he cut himself on them with new lyrics entitiling the results “Let’s Start All Over Again” and “All I Need Is Someone Like You”. These versions weren’t issued in the US but appeared on a very fine Japanese collection of his rare tracks entitled “Goodie Goodie Good Times” in 1979. Evans then recorded another classy 45 for his own DPR concern. Both sides had more than a touch of the Tyrone Davis about them. I like the pounding “This Time With Feeling” very much, but the better known track is “The Look On Your Face”. This has been recorded by several stellar names - James Phelps and John Edwards for example – and others like the Magnetics – often using the same backing track but it is a tribute to Evans that he isn’t outclassed in the slightest by the comparisons. 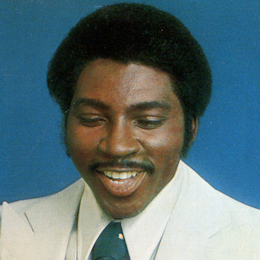 In the mid 70s Evans was drafted into the Impressions to replace Ralph Johnson, recording two Cotillion LPs with the group, “Fan The Fire” and “It’s About Time”. The biggest selling 45 from the sets was “It’s Time” which made the top 40 R & B charts in at the beginning of 1977. After leaving the Impressions Evans cut a very fine single for the Georgia based Points East concern in 1984. Get In Touch With Me was a big city ballad updated for the 80s on which Evans’ melodic tones were heard to great advantage. Following this he joined a Temptations off shoot "Ruffin, Kendricks & Edwards: Former Leads of the Temptations" in the 1980s which also featured the excellent David Sea. Since then he has been fronting a version of the Temps touring as part of packages like “Tribute To Motown” singing lead. I think he deserves this limelight as he really is a first rate purveyor of emotion – and that’s what soul music is all about. 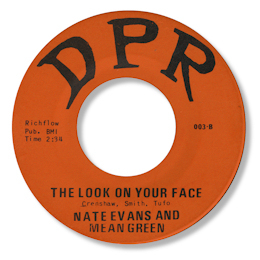 UPDATE ~ Patrick Biggerstaff has written to say that "there is an issue on the same label (DPR) credited as Nate Evans and Buss, this would appear to be the harder of the two 45's to track down. "Get In Touch With Me" was also issued on a 12'' on Points East. I'm grateful to Patrick for this info. Note - You can find "Main Squeeze" on the Ace UK CD "Twinight's Chicago Soul Heaven" and on the Eccentric Soul CD "Twinight's Lunar Rotation" which also has the brilliant "Pardon My Innocent Heart" as well.